Background: Muscle stiffness is a potential complication after injury and has been shown to be a risk factor for injury in healthy individuals. Objectives: The primary purpose of this study was to assess the short-term effects of manual therapy (MT) on muscle stiffness of the gastrocnemius in both a relaxed and contracted state. The secondary purpose was to assess the reliability of a novel clinical tool (MyotonPRO) to measure muscle stiffness in the gastrocnemius in both a passive and contracted state. Methods: Eighty-four consecutive healthy individuals were randomized to receive Manual Therapy (MT group) directed at the right-side ankle and foot or no treatment (CONTROL group). Muscle stiffness of the gastrocnemius was assessed bilaterally in all participants at baseline and then immediately after intervention in a relaxed and contracted state. Group (MT vs. CONTROL) by side (ipsilateral vs. contralateral) by time (pre vs.post) effects were compared through a 3-way interaction utilizing mixed model ANOVA. Reliability of the MyotonPRO was assessed with two-way mixed model intra-class correlation coefficients. Results: There was a significant 3-way interaction for muscle stiffness of the gastrocnemius in a relaxed state (p < 01), but not contracted state (p = .54). All conditions had increased resting muscle stiffness from pre to post measures except for the ipsilateral limb of the MT group. There was not a significant interaction for muscle stiffness in a contracted state. Reliability estimates (ICC) for muscle stiffness measures ranged between .898 and.986. Conclusion: The change in muscle stiffness of the gastrocnemius in a relaxed state depended upon whether individuals received MT. Muscle stiffness measures were highly reliable based on single measurements. Level of evidence: Therapy, level 2. Keywords: Muscle stiffness, Gastrocnemius, Ankle, MyotonPRO, Manual therapy, Reliability. 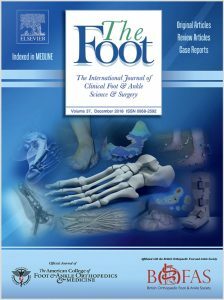 This study was one of the first to assess the effect of manual therapy interventions applied to the foot and ankle joints on gastrocnemius muscle stiffness in both a relaxed and contracted state. In this study, individuals receiving manual therapy intervention directed at the foot and ankle demonstrated no change in muscle stiffness in a resting state, whereas individuals not receiving manual therapy exhibited a slight increase in muscle stiffness. This may be important when designing rehabilitation programs for individuals who may be at risk for developing a musculoskeletal injury. In addition, the MyotonPRO demonstrated excellent reliability in both contracted and relaxed states with a single measurement and seems appropriate for clinical use.